All the money goes to the Unicode Consortium. 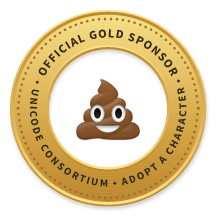 Today, somebody going by the name “Jason Jenkins” became the proud sponsor of the coveted Poo emoji and it cost him a cool $5,000 to claim that title. The money all went to the non-profit Unicode Consortium, which is dedicated to making modern software and computing systems support the widest range of human languages. What’s the point in sponsoring a poo emoji if you can’t flaunt it a little? What is the Consortium hiding? What poo is there to unearth? Typically companies are the ones that make these sorts of donations, such as IBM sponsoring the cloud emoji at the $5,000 level, or sports teams such as The San Jose Earthquakes soccer team sponsoring the soccer ball emoji. So it’s not common to see a singular name on the list and Inverse is dying to know who Jenkins is and why he was motivated to make such an awesome donation. Other sponsors have included links to more information about them if they wish to be identified but Jenkins has no such information. Others have donated anonymously but he didn’t take that route either. Anyone can adopt a character for their own and it goes as a tax deductible donation to the Consortium. Bronze level is a donation of $100 and $1,000 gets you a silver ranking. Unicode is rolling out 72 official new emojis on June 21 including bacon, a pregnant woman, clown face, and a martial arts uniform. These releases tend to be controversial for not being diverse enough and some have questioned how all of this work in emojis ultimately advances the use of language programs online. Check out the full list of donors and sponsor your own emoji on the Unicode website.